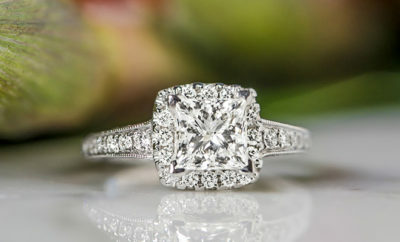 Choosing His Wedding band - Shane Co.
After choosing an engagement ring for your bride-to-be, selecting your own wedding band will be a piece of cake. You can go for a plain band or one with more detail – perhaps even some gemstones. The main quandary is what metal you want to go for. Some of our bands combine metals (check out our gold and silver Perfect Union Collection) to keep things interesting! Sterling silver is a metal containing 92.5% silver and 7.5% other alloys – often copper, germanium, zinc or platinum. In its purist form, silver it too soft to be made into jewelry, hence the need for the added alloys. Should any tarnish appear, it is easily cleaned. It also has a lower price point than both gold and platinum. ColbaltCobalt wedding bands are becoming increasingly popular for their many positive attributes. For starters, they are extremely strong – four times harder than platinum, five times harder than gold and seven times harder than silver. This resilience and durability means that cobalt is shatterproof and scratch resistant. Due to its white color, cobalt has been likened to platinum in terms of appearance. It has a high luster that won’t fade or discolor over time.